I have found the ordinary people to be very friendly. The younger generations are learning how to speak English, and can generally offer some help or opinions. The communist party tends to be a little paranoid, but so does all governments it seems these days. The current winter weather situation has the government a little nervous that it might tip things into general unrest, as upset people are unable to get home for the Chinese New Year. Beijing is busy preparing for the 2008 Olympic Games. The main stadium appears ready from the outside, but it is hard to tell for sure. The locals call it the bird’s nest, because that is what it looks like. They are not finished yet, but knowing the Chinese, it will be ready to go, they have the labor force if they need to go 24-7 to get it done. Because of the weather situation, and the fact they only would give me a 30-day visa, my stay in China was limited to select locations. First Beijing, and of course a venture out to scramble along the Great Wall. There is something special about being able to climb on something you have heard about since childhood. There are many segments to the wall, and different periods of time when it was built, which would take more information then I have time and space for. But the bottom line is this; the shear nature of the size, scale, and the manpower to create it is simply impressive. Of course Tiananmen Square, which symbolizes the moment that China almost inched into a Democracy. I believe China is anxious for the Olympics to come, so a new image can be created about China that goes beyond that moment in time. 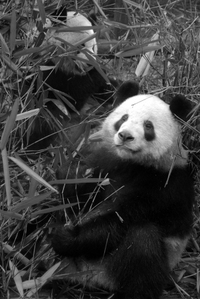 Pandas in Chengdu. Who couldn’t fall in love with these flexible black and white fur-balls? The future of the panda is in question, as the habitat shrinks. One thing is for sure, the Chinese are aware of the economic opportunities with pandas, which might just save them from disappearing from the face of the planet. People are willing to pay good money to see them and even more money to have your photo taken with one. Xi An (pronounced She Ann) is the home of the Terracotta Warriors, once the capital of China, and the start and end of the famous Silk Road. 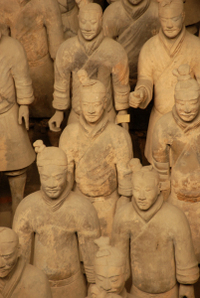 The emperor was ready for the next battle, as he was buried with thousands of clay warriors ready for action. One of the most interesting aspects is each soldier is different, and many are smiling. Waiting for me in Shanghai were friends Long Gen and King, family to a friend of mine in Nebraska and the magazine Riches. Of all the cities I had visited in Asia, Shanghai felt the most western. The staff at Riches magazine were kind enough to show me around to places that I would have missed. I also had two different posters printed up to market back in the US. Example of these will show up on my web site, so be sure to check back. My journey is coming to an end. Ten months I have been on a steady move around the world. It’s time to come home and rest. To finish my writing, reflect on what has been learned. Time to take inventory of myself and what is next. The blog will continue. In March I head for Germany for a week of presentations. Teachers, students, or anyone for that matter will be able to send questions to the blog entries. In Colorado a teacher is setting up an after school writing program utilizing my web site and blog to use as a writing tool and motivator for students. How cool is that? I remain committed to bringing the interesting world into the lives of everyday people. It's emily again from highland! thank you for e-mailing me back. have you posted the pictures of highland? well i've got to go now! Well, I have met families who travel, so I know it's possible to do both, but it takes special people to do that. I do stop traveling when I come back the United States for periods of time. During these windows I edit photos, work on my writing, update my information on my web site and things like this. How is it at highland? Just wanted to ask!! I love when you came to visit Highland elementary. I hope you remeber me! My name is Emily. Im in Mrs K-Ts 4th grade class. The pictures where amazing. I also loved your presentation! What has been your favorite place you have ever been to. How you ever thought of starting a family? If so do you think you would have to stop traveling? Lastly, Have you ever ever stopped wantted to stop traveling? We were just wondering what your favorite color? Have a great day! Yes, while I was in China, I ate lots and lots of Chinese food. But, Chinese food in China is different then the American style we are accustomed to here. I bet your tired. I wish I could go to China. Did you eat Chinese food when you were there? YES, I love traveling around the world. And one of the great things about traveling around the world is all the cool food you get to try. Cool, I'm looking forward to my visit to your school! Please make sure you introduce yourself. To Mrs. Guthrie’s and Mrs. K-T’s 4th grade classes. Thanks for the post on my blog; I to am very excited about my upcoming visit to your school. You have followed me on this amazing journey and now I have the privilege to share it with you from a first hand experience. I don’t really have a favorite thing about China; it is a very interesting place. For sure though, seeing the pandas would rank high on my list. Yes, the camels of Mongolia are native to that part of the world. Actually Mongolia has a very large desert, it just doesn’t look like the desert of Africa or Arabia. My stay in China was cold, they were in the middle of the worst winter they have had in 100 years. It was my dream to travel and learn about the world. It’s a lot of fun to be with people who speak other languages. The most important language is the one that comes from the heart in the form of kind actions. It was a blast to travel around the world! Yes, I like Chinese food; my favorite kind was what ever was cooking! The Chinese food I had was similar to what I eat back home, just more variety. I never got the chance to see any schools in China. Since 2001 I have traveled 3 ½ years! Long time huh? I never entered a hospital, that’s a good sign! My favorite thing about traveling is how much you get to learn about the world, and yourself! I am at high land and i can't wait for you to visit our school next week!!!!!!!!!!!!!!!!!!! I have been inspired by you and can't wait to meet you!!!!!!! Dow do you like travel around world? Do you like trying all the differant food? We can't wait for you to come to our school next week! We've learned many things about your journey through your super awesome website. We have a lot of questions for you. One of them is, what was your favorite thing about China? Are the Camels in Mongolia native to the area? We are used to seeing them in the desert. What was it like to stay in China? Why did you choose to travel around the world? Did you go across the Great Wall of China? How is it to be with people that speak other languages? Did you like the chinese food, and what was your favorite kind? How was it different from chinese food in the U.S.? What are the schools like in China? How long have you been traveling? Can you describe their hospitals there? What is your favorite thing about traveling? Thanks for the post on my blog. I hope I will have the chance to meet your friend Henry. It is important to have good friends in life, that can often help us along the way. So, do you want to see animals in the wild one day, and if you do, which ones? Thank you for the post on my blog. The boats were really cool! I was like a little kid again as I explored the deserted ships. I don’t know how old they were, maybe 50 years?? There was no one around to ask. Riding the camel was fun, and awkward. Horses are much easier to ride. One day I hope you can ride a camel too. Where in the world would you like to ride a camel? Thanks for the post on my blog. I have been to England only once and that was to London. One day I will go there and spend more time. In China I ate Chinese food every day, it was good. There are many different types of Chinese food, some is really spicy, other just plain different, like fish head soup! Would you like to try fish head soup? Would you like to go to China one day to see the pandas? My life is good, thanks! A poacher is someone who kills wild animals illeagally. They call the head male of the family a silver back, because the hair on his back turns silver as he ages. Well, I didn’t really know for sure what the gorillas were thinking, it was more of a guess. Do you want to see the gorillas in the wild one day? I'm from Highland Elemantary School in Mrs.Guthrie's fourth grade class. I have some questions for you and one is Do you know how old the boats were?There were so many things I learned from the pod cast on Sudan.One of my other questions is was it fun on the camels?It sure did look like it.Is riding the camels like riding horses?I want to ride a camel.I hope you will write me back!!! No, I didn’t see any Panda bear rugs. This is a good thing, because they are an endangered species, which means they are having trouble surviving. I didn’t touch a Panda. I did have a chance to hold one, but they wanted to charge $100 dollars for that, and it was more then my budget would allow. Also, it seems a little wrong to me to charge that kind of money to hold a wild animal. Thank you for the kind words they are really appreciated. What is your favorite wild animal? I hope one day you can see pandas, especially the baby ones! Thanks for the post on my blog; I am happy to have you along for the journey. Yes, I am happy to be home with my mother. At the moment she’s not feeling so well, so it is really good that I am home right now. The Pandas were really cool to see! What is your favorite wild animal? The most favorite thing I wrote about is a hard question, because I had so many cool things to share with the readers. One of my favorites had to be the mountain gorillas in the Congo. If you could write a story about somewhere in the world, what would you write about? Thanks for the post on my blog, I am happy to have you along for the journey. I’m glad you liked the Podcasts! They are a lot of work to create, but worth it when I hear comments like yours. I went to see gorillas because my major when I went to Wayne State College was biology. I have also been curious and interested in nature. Mountain Gorillas are a threatened species, so I went to learn what we can do to help protect them. Hi!This is cameron,a 3rd grader at Highland Elementary.I live in Colorado but I was born in England.I was wondering if you have been to England?I think the panda picture is adorable!I was wondering if when you were in china you ate chinese food,what was it like? How is your life? My life is good. We watched a gorilla podcast. Whats a poacher? Why are Silver back Gorillas called that? How do you know what the gorillas were thinking? As you can see I have a lot of questions. My name is ALEX. Have you seen any panda bear rugs? I heard people make them. Have you touched a panda at all? I liked when you emailed me back in 2007. Thank you for putting up the website. You are cool. I saw a panda on your website. It was cool. Are you glad to be home with your mother? Thank you for putting on your website. You are cool. I like the thing you discovered and I liked the panda bears best. I like yourwebsite and I like you as a friend. I think you are smart and you are cool. Everybody is discovering you because we like you as a friend and everybody at my school is typing to you. What was your favorite thing you wrote about? I am the kid on your website with the Diamond Back shirt. It is on the newsletter about Highland Elementary. I've watched a lot of your pod casts. I like all of them that I have watched. Why did you want to see the gorillas? When you get this letter could you please write back to me? But take as much time as you need.